Do you have a blog? 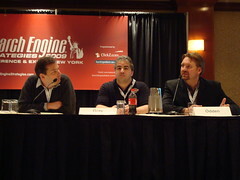 If so, a panel today at SES NY shared how to improve SEO results with your blog and its RSS Feed. 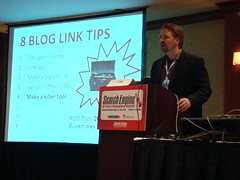 Michael Gray, Owner of Atlas Web Service, shared the following tips to increasing SEO value with your blog. Bad titles lack keyword focus, are often clever or amusing and therefore not intuitive to a reader or search engine. Good titles include keywords and are focused on topics covered within the post. Why do you want to use full feeds or be fully dressed? Full feeds allow you to benefit from web scrapers and build links for you. Make sure you put keyword optimized hyperlinks within your post, specifically to pages that are more difficult to build Links to. By putting your blog on a sub-domain or sub-folder on your domain, you are able to consolidate Link equity. Don’t blog for the sake of blogging. Have a purpose. Blog at whatever frequency allows you to be exceptional. The longer the time period between posts, the more exceptional you have to be. Have an opinion, be serious, be funny, be politically incorrect, be a moral compass – be something. 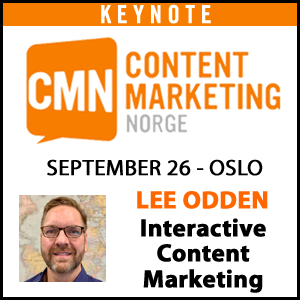 Leverage your network, before and after the post goes live, to help promote your content. Make sure people know who you are. 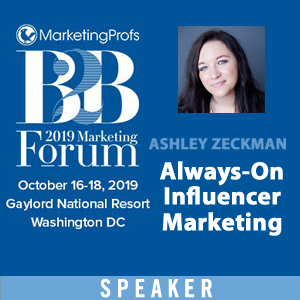 Connect with other influential bloggers. Start by Linking to and/or commenting on their blog. 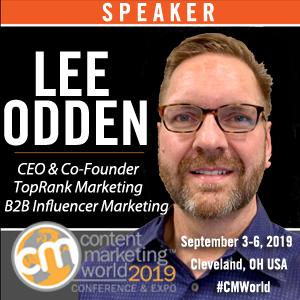 Next is TopRank Marketing CEO, Lee Odden, who takes the audience through building Inbound Links to your blog, in turn creating increased search engine visibility. Give them a reason to link to you and read your blog. Blog software will often fire off an email when someone Links to your blog. Link to influentials and at the very least get on their radar. Don’t Link for Links sake, but do it with purpose and to provide value. Check out the TopRankBlog BIGLIST. It currently has just under 60,000 Inbound Links. For example, an RSS Tool created by TopRank Marketing SEO Guru, Thomas McMahon, has over 260,000 Inbound Links. Give recognition to a useful tool while letting the community interact and engage. Or run a poll and create a badge for the winner, which gets placed on their site and Links back to your blog. Create a badge page and make it easy for someone to upload the badge to their site, with a Link back to you. Getting syndicated, in an intentional way, to create Inbound Links back to the blog. Collectively, the Inbound Links add up. Make it obvious what your blog is. Print your blog URL everywhere you list your phone number or website. Dynamically embed a Link to the post in your RSS Feed. Next up is Michel Leconte, CEO of SEO Samba. Search engines, including Google, pay attention to relevancy, freshness and quantity. Build up RSS Feed subscribers by writing content, re-purposing existing content and distributing. Gain traffic and juice by deep Linking. Distribute broadly by formatting, promoting latest posts and by dicing content into categories and interest. Question: What about Linking within comments? Answer: Oftentimes the Links are no follow, so it may not be useful for building Inbound Links but commenting is useful in networking with other blogs and providing value to the conversation. Question: What about news blogs that don’t have time to do more than post press releases? How do you get additional coverage for the news content? Lee spoke to the idea of discovery. Identify which news sites you would like coverage on and then make your content discoverable to the influentials. You can do this by networking with people already getting covered on the site or network with the decision maker directly. Michael added that you can check out other aggregating sites and identify who is submitting content relevant to your topic or vertical and begin by networking with them. They can become a great resource to getting your content more exposure. If you have more tips on creating SEO value through blogs and RSS Feeds, please share below. We’ll keep them in mind..
There’s a few we still need to work on! These are some great tips. It is important to wright effective titles that contain a couple of your keywords as well as making it sound interesting so people will read your post. But then you have to make sure the content of your post is of high quality and is relevant and people will find it of interest and leave you a comment. How about hosting blog carnivals on your blog where you select a topic of the carnival [related to your industry of course] invite other bloggers to send in their posts and publish them on your blog. That’s a great idea – I’ve seen many other bloggers do that. We’ve not tried it ourselves yet. Ya – you should try it once – it works! I agree that the focus of social media needs to be on the customers and what they have to say as well as building a good relationship between them and your brand. So many times, companies will set up a social media plan or program but they get so focused on the program that they lose sight of the most important asset they have…the customer! 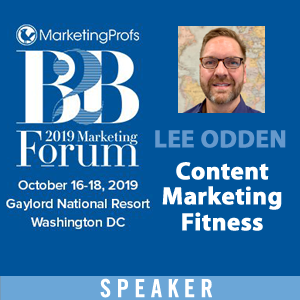 Lee Odden once again continues to provide essential value-based recommendations and data surrounding SEO and PR. The guy is spot ON every time. Thanks Lee!! Though I have seen most of the content several times before, some times it is of great value to see it reworded. It’s worth to remember that without the teacher (you)even basic knowledge will remain unknown. I will print out this article and use it as a checklist, for all my present and future blogs.